Amazon Lightsail is the easiest way to get started with Amazon Web Services (AWS) if you just need virtual private servers. Lightsail includes everything you need to launch your project quickly – a virtual machine, SSD-based storage, data transfer, DNS management, and a static IP – for a low, predictable price. This tutorial shows you how to launch and configure a WordPress instance on Lightsail. It includes steps to connect to your instance by using SSH, sign in to your WordPress website, create a static IP and attaching it to your instance, and create a DNS zone and mapping your domain. When you’re done with this tutorial, you have the fundamentals to get your instance up and running on Lightsail. This tutorial requires an AWS account. Sign up for AWS, or sign in to AWS if you already have an account. Get your WordPress instance up and running in Lightsail. For more information about creating an instance in Lightsail, see Creating an Amazon Lightsail instance in the Lightsail documentation. On the Instances tab of the Lightsail home page, choose Create instance. 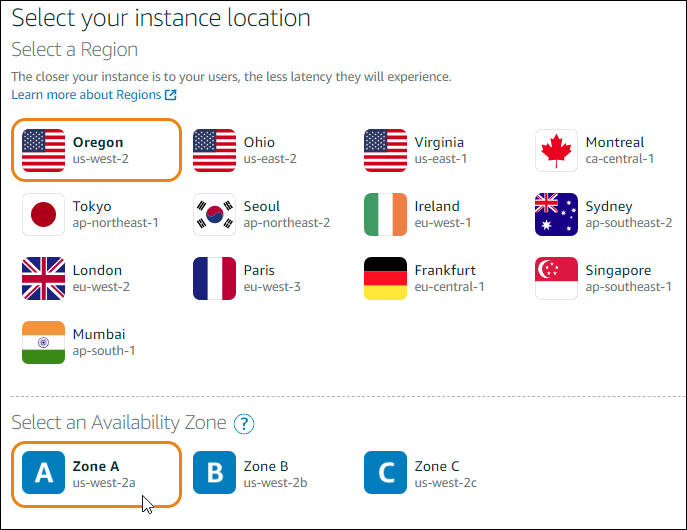 Choose the AWS Region and Availability Zone for your instance. Choose Linux/Unix as the platform. Choose WordPress as the blueprint. The default password to sign in to your WordPress dashboard is stored on your instance. Retrieve it by connecting to your instance using the browser-based SSH terminal in the Lightsail console and running a special command. For more information, see Getting the application user name and password for your Powered by Bitnami' instance in Amazon Lightsail in the Lightsail documentation. On the Instances tab of the Lightsail home page, choose the SSH quick-connect icon for your WordPress instance. 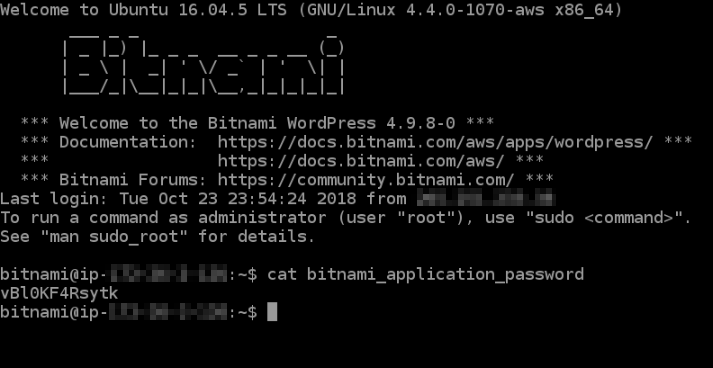 If you're in a directory other than the user home directory, then enter cat $HOME/bitnami_application_password. Make note of the password displayed on the screen. You use it later to sign in to your WordPress dashboard. 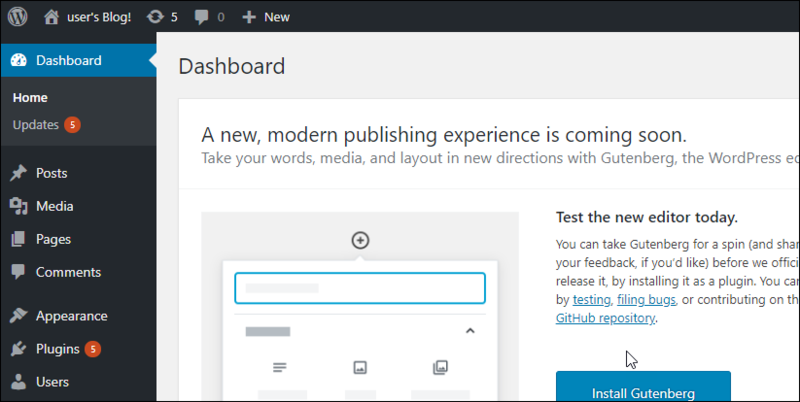 Now that you have the password for your WordPress dashboard, you can sign in. You can change your password, install plugins, change the theme of your website, and more. For more information, see Getting the application user name and password for your Powered by Bitnami' instance in Amazon Lightsail in the Lightsail documentation. Make sure to replace <public IP address> with the public IP for your WordPress instance. In the Username or Email Address box, enter user. In the Password box, enter the default password obtained earlier in this tutorial. You are now signed in to your WordPress dashboard where you can perform administrative actions on your website. For more information about administering your WordPress website, see the WordPress Codex in the WordPress documentation. The default public IP for your WordPress instance changes if you stop and start the instance. A static IP address, attached to an instance, stays the same even if you stop and start your instance. Create a static IP address and attach it to your WordPress instance. 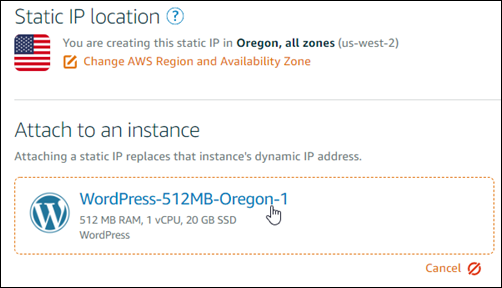 For more information, see Create a static IP and attach it to an instance in Amazon Lightsail in the Lightsail documentation. 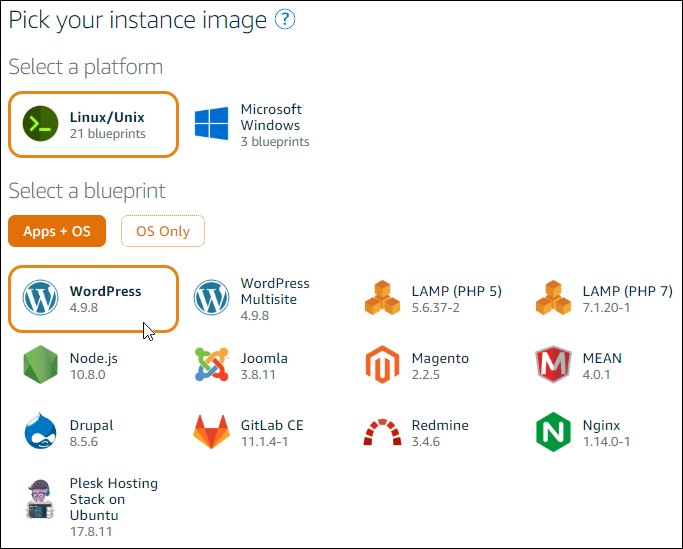 On the Instances tab of the Lightsail home page, choose your running WordPress instance. Choose the Networking tab, then choose Create static IP. The static IP location, and attached instance are pre-selected based on the instance that you chose earlier in this tutorial. Name your static IP, then choose Create. 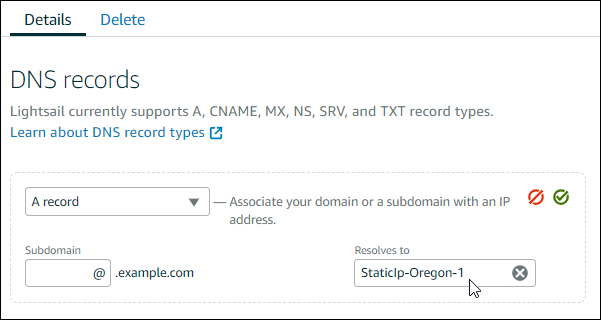 Transfer management of your domain's DNS records to Lightsail. This allows you to more easily map a domain to your WordPress instance, and manage all of your website’s resources using the Lightsail console. 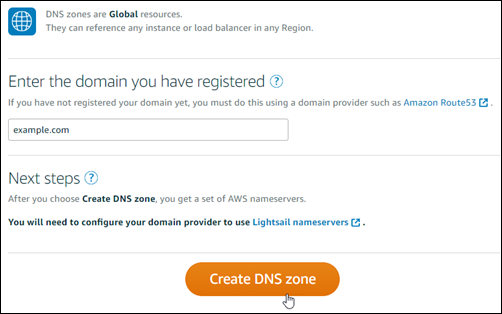 For more information, see Creating a DNS zone to manage your domain’s DNS records in Amazon Lightsail in the Lightsail documentation. On the Networking tab of the Lightsail home page, choose Create DNS zone. Enter your domain, then choose Create DNS zone. Make note of the name server addresses listed on the page. You add these name server addresses to your domain name’s registrar to transfer management of your domain’s DNS records to Lightsail. In the DNS zone for your domain, choose Add record. In the Subdomain box, enter an @ symbol to map the apex of your domain (such as example.com) to your instance. The @ symbol explicitly symbolizes that you’re adding an apex record. It is not added as a subdomain. In the Maps to box, choose the static IP that you attached to the WordPress instance in the previous step of this tutorial. Allow time for the change to propagate through the internet's DNS before your domain begins routing traffic to your WordPress instance.